The Levant Mine is famous for its undersea rich deposits of copper and tin which were pursued for more than a mile out under the Atlantic Ocean. It is also well known for its long working life from the end of the eighteenth century to 1930. At the heart of its remains, on the cliff top, still stands an engine house with its winding engine intact. 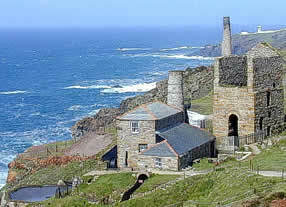 This beam engine (or whim, to give it its Cornish term) is the sole surviving item of machinery of the mine. The winding engine stands in the same house where it worked for 90 years, perched on the edge of the cliff, making it the most westerly steam engine in the country. It is also Cornwall's oldest. Built in 1840 by the West Country's foremost engine builder, Harvey and Co. of Hayle, it is said to have been designed by Francis Michell, a member of a distinguished Cornish engineering family. The engine also has a national claim to fame. It was Britain's first beam engine preserved on its working site by private individuals. That was in 1935, five years after the mine closed, and led to the formation of the Cornish Engines Preservation Society, now the Trevithick Society. A plaque commemorating the contribution of the Society's late President, Jack Trounson, to the engine's rescue from scrap is displayed in the engine house. Today the engine is owned by the National Trust, having been handed over by the Society in 1967 along with other engines including Taylor's 90 inch pumping engine and Michell's 30 inch whim, both on display at East Pool, Camborne.